Back before cell phones, at least before cell phones were smaller than a shoebox, the landscape was dotted with glass and steel cubes known as phone booths. They were a necessary part of life and I remember many a lunch hour spent looking for the nearest one so I could return a call or check my messages (see "answering machine"). 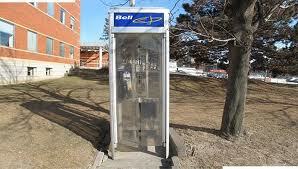 Thus, phone booths were also an often seen set in movies and tv shows. They were portable, easily dressed, corralled actors into one small 3x3 space, and you could throw one up on any corner and shoot two pages of dialogue with minimal fuss. Being the easiest scene of a movie to shoot, it was often put off multiple times. It would be scheduled and then, as the day went longer, bumped to some other later day when it could be erected in any nearby parking lot. Thus a common sight in the caravan of trucks, honeywagons and vans that make up the production transpo pool would be a stakebed with a phone booth strapped to the bed. It would follow us from location to location, just waiting for that spare couple of hours when it could get unceremoniously retired as a location and released from it's stakebed prison. This pretty much sums up how the last two weeks are going to be. Anyone who has done TV sees this coming. The last two weeks of a long season are almost always drudgery. The hours are long and the schedules are insane as the studio tries to tie up all the loose ends, pick up any missing inserts, or reshoot any unsatisfactory scenes (like we did last night, five pages worth). In the midst of this cleanup work are the actual pages from the current episode that have to be shot, giving rise to the old Hollywood saying, "Chaos breeds cash." There's always one scene that gets put off over and over until finally, it has to be shot. I call those our "phone booths." We are now into two weeks of knocking out our phone booths which makes for some long days. We've also gone from a month or two of relative ease (a lot of steadicam and handheld) to suddenly every shot being on the dolly. Monday night we built not one, but two exterior dance floors, made infinitely easier with the aluminum bucks, but still more of a pain than you want to get into at the end of a seven month run. At least tonight we have a Moviebird so hopefully there won't be any need for exterior dance floor. We are beginning the first of about six splits at our ranch out toward Malibu and it promises to be the typical two week battle toward the finish line. So I may be an infrequent poster for the next few days but I'm still around. Out in Malibu. In a phone booth. Well, we're reaching the end of another six month run. I'm starting to develop that "last week of school" mentality (along with everyone else) which is ironic because now is when the work really ramps up. It's the climax/cliffhanger episode, so the action gets more intense, the moves get faster and more intricate, and the hours get longer. My show is inherently dance floor-centric. I rarely lay track except exteriors and for really precise effects shots anyway, so this week at least I was lucky to be on one of our few dollyable set floors. It's funny how after so long on a show you become really familiar with what you can and can't get away with. For instance, I know which sets I can get away without a floor on lenses wider than 50mm and which room entrances are 7' and which are less, and can immediately decide what I need (that sounds pretty easy until you realize we have 6 stages, each with at least two sets, and at least three standing exterior sets that we regularly return to. Knowing these sets as intimately as I do saves a lot of time in setup and allows me to often bring along only what I know I'll need or what I know will fit. If I was really organized, I would keep a notebook of all the sets and their dimensions as well as floor ratings, but, as I said, at this point it's drilled into my head so it would be redundant. Maybe next time. I did a show a couple of years ago with an operator who was really unhappy with his previous dolly grip. He said he wasn't very good, although he was such a nice guy that he let it slide and powered through. I recently saw the movie he was talking about and everything looked fine. Moves were consistent and smooth and I didn't notice any bad booms etc. But, I don't know how many takes were needed to get the shot, or how the shots may have been compromised to make them doable for the dolly grip. The moves were pretty standard, nothing like the fairly technical work of Super 8. This brings me back to the point I've often made that the dolly grip often makes his money and proves his worth in set up. Making quick decisions, insulating your operator from having to make decisions for you, and getting the shot in the least number of takes possible is something that only someone who was on set would ever know. I try to always keep this in mind that I'm here as a team member with my camera operator. If I can't carry my weight, he has to carry his, and part of mine for me. Picked up a feature in August, so I'm headed back to Atlanta in late July. If anyone has anything in particular they'd like to discuss, shoot us an email or comment. Alfeo, I haven't forgotten your question about remote heads, it just keeps slipping my mind. I'll get to it.